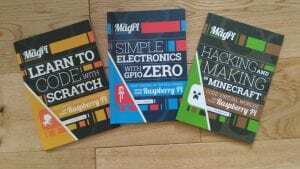 This entry was posted in code, CoderDojo, Publications, Raspberry Pi and tagged book, coding, GPIO Zero, hard copy, Minecraft, Raspberry Pi, Scratch. Bookmark the permalink. I was informed on another forum that the links on this post have to be typed in as the text could not be copied and pasted into browser. Say no more. I will set up an active link immediately. Thank you Lynda. That is done and dusted! My brother and I love Minecraft so I would like to get the hacking Minecraft book.